At first glance, European readers will probably assume this is a bellflower. Well, it is and it isn't. It is Campanulaceae, just like the European bellflowers Campanula spp, but it is the closely related southern hemisphere member of the family, Wahlenbergia. 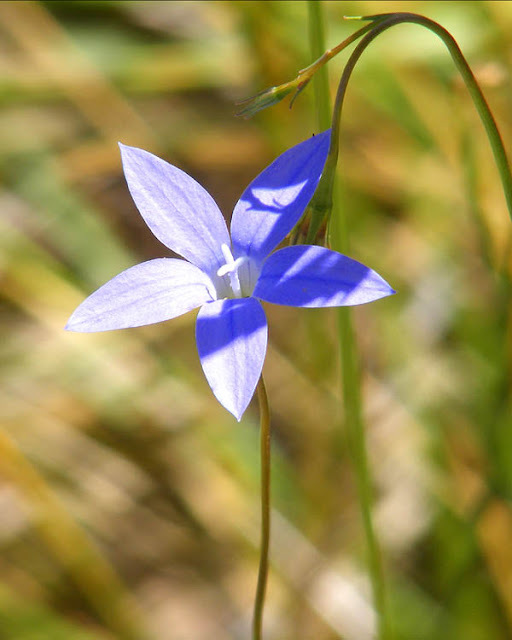 This pretty and common wildflower is called the Australian Bluebell W. stricta. 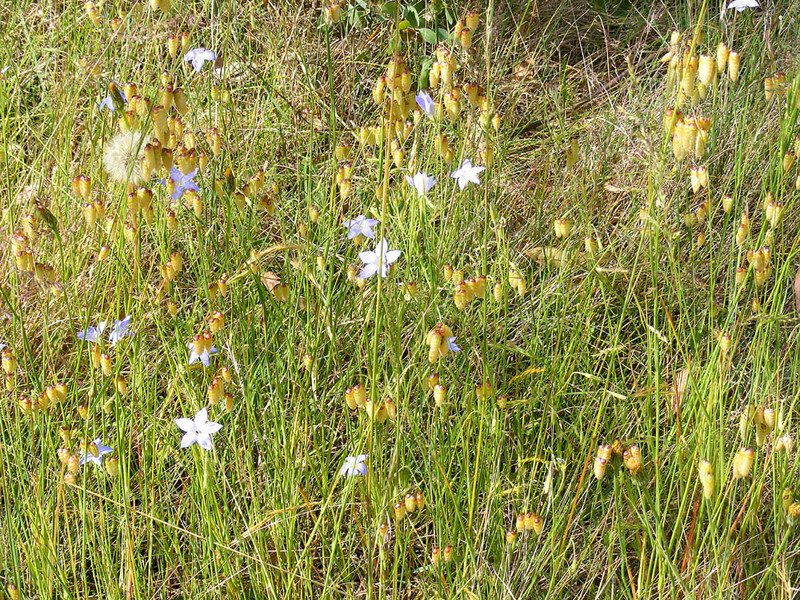 The Quaking Grass Briza maxima with which it is growing is an attractive, but invasive alien plant which out competes the native vegetation and reduces the biodiversity of any area where it is established. You can see why Canberra is sometimes dubbed the Bush Capital, in this view taken from Melba looking towards Belconnen. On the shore of Lake Ginninderra you can see the big buildings of the Westfield Belconnen shopping centre, as well as some government offices. In between them and the camera are suburbs dominated by the many gum trees in parks and private gardens. 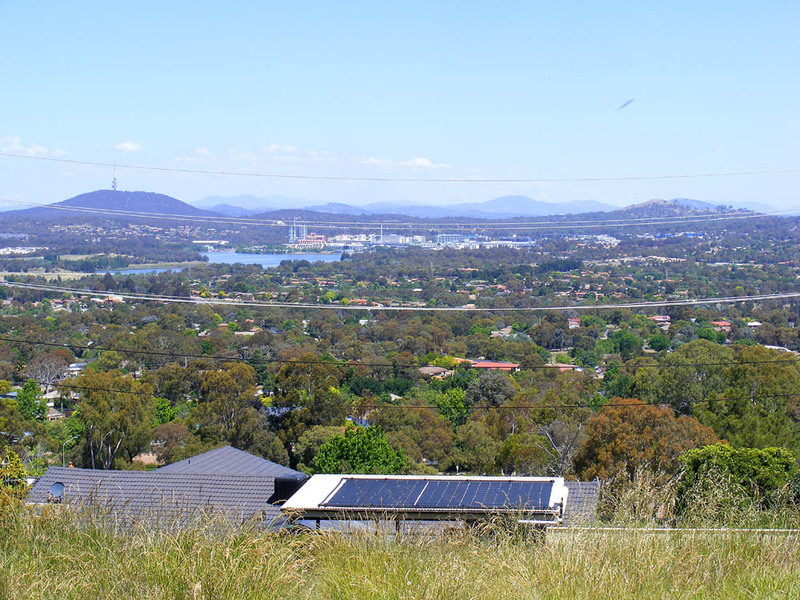 Over on the far left is Black Mountain, with its telecommunications tower just visible, and the Brindabella Mountains National Park in the distance. Weather Update: Yesterday was freeeeeeezing! It wasn't actually all that cold, but we had been away with clients for a couple of days, so the house wasn't as warm as it could have been, and outside was just miserable. All around us people were reporting snow! We are sitting under the edge of a gigantic Atlantic storm which stretches from Newfoundland to Portugal, and the Caribbean to Greenland, sucking cold air down from the Arctic regions over us. Brrrr. Car Key Update: In an attempt to locate my Renault key I have revisited the restaurant we had lunch in on the Friday, popped into the police station just next door to it and asked at the town hall just down the road in Saint Pierre des Corps. Nobody had handed it in, but the ladies at reception in the town hall were lovely. 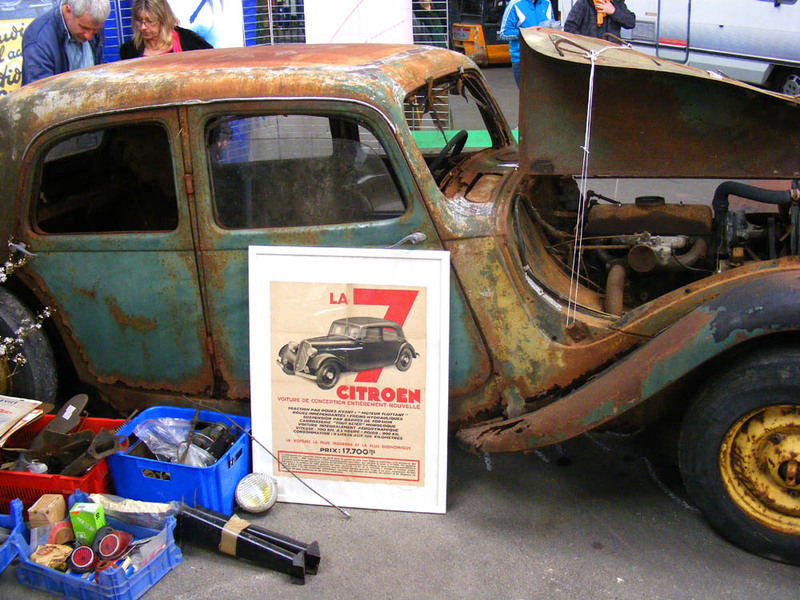 Jean-Louis asked the organisers of Saturday's car show if anyone had handed it in there, but no one had. He suggested I contact the town hall in Chatellerault to check there, which I did by email and got no response. Not giving up though, I also emailed the town hall in Montlouis, where as you know from yesterday's blog post, we spent some time. Within about an hour a woman from the Montlouis town hall rang me to say someone has handed in my key to the municipal police there. I had described where I might have lost the key and what it was attached to, so she is sure it is my key. She asked me if I was going to be in Montlouis in the next few days. As I was not planning to be, she has offered to courrier the key to me (but because of Easter it will be sometime next week when it arrives). What an absolute star! and many grateful thanks to the anonymous person who found it and took the trouble of handing it in. I suspect it was one of the council parks and gardens staff. Recently we needed to visit the Notaire (notary or government solicitor) at Montlouis. We were looking for a garage to rent near Saint Pierre des Corps, so the 'old ladies' don't have to put in so many kilometres. The Notaire at Montlouis was advertising one that seemed ideal, but we were slightly too early and they would not have reopened the office after lunch quite yet. So we sat on a bench and watched life on the Loire for 10 minutes. A sandbank mid stream, with cormorants and gulls. The river landscape is created by the flooding and flow of the water. 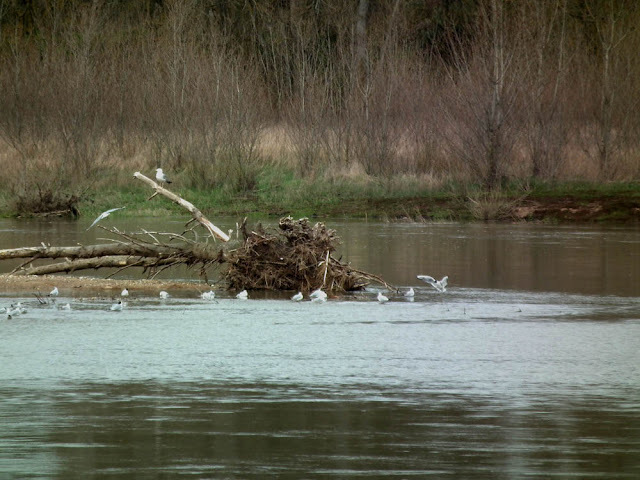 Numerous sandbanks and islands are formed mid stream, each having an assemblage of plants and animals that benefit by being protected and are often rare elsewhere. Gulls gather around some driftwood at the tip of a sandbank. In the spring and early summer, certain species of birds nest on the sandbanks. Often the nest is just a small shallow depression in the sand, and they are subject to several possible disturbances (flood, human activity, predators). Consequently, the Ligue pour la Protection des Oiseaux (LPO) has been invited to manage the islands and sandbanks, and has erected signs saying you are not allowed to disembark onto them between 1 April and 15 August. You are also not allowed to get closer than 30 m to the birds, to prevent them being disturbed. The LPO and the local authority are proud of the fact that so many birds choose this place to nest, pointing out that it is a sign that the water quality is good and the river ecology is healthy. Looking across the river to the opposite bank. The birds to look out for are Common Tern Sterna hirundo (la Sterne pierregarin in French), Little Tern S. albifrons (la Sterne naine in French), Common Sandpiper Actitus hypoleucos (le Chevalier guignette in French), Black-headed Gull Larus ridibundus (la Mouette rieuse in French), Mediterranean Gull L. melanocephalus (la Mouette mélanocéphale in French) and Little Ringed Plover Charadrius dubius (le Petit gravelot in French). The terns and the plover are migratory, arriving from Africa in the spring and returning there after the nesting season in August. These Loire river sandbanks are the only place in France that the Little Tern nests. The Mediterranean Gull is also very rare in France. 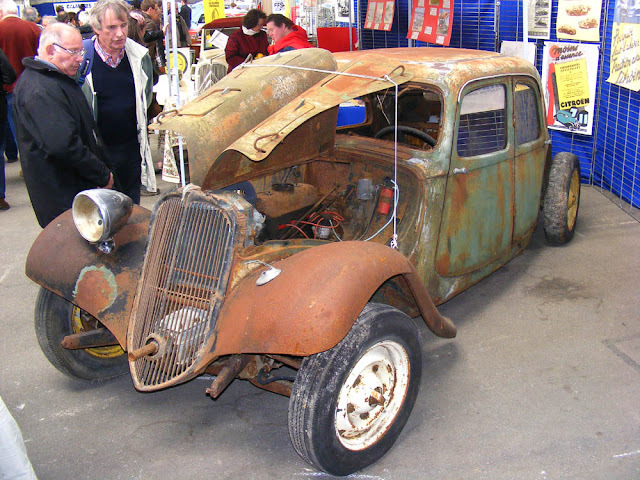 This pre-war Traction was part of the display put on by our club at the recent Auto Bourse in Chatellerault. I think it belongs to Jean-Louis, one of his many 'garden ornaments'. The poster says 'Why you should buy a Citroen Traction Avant'. Simon joked with him that it looked about 3 days work to get back on the road. Jean-Louis responded that 'no, no, it was 4 and you would need a good supply of wine'. Jean-Pierre, our president, kept telling everyone it was a work of art now, and there is an element of truth in that. 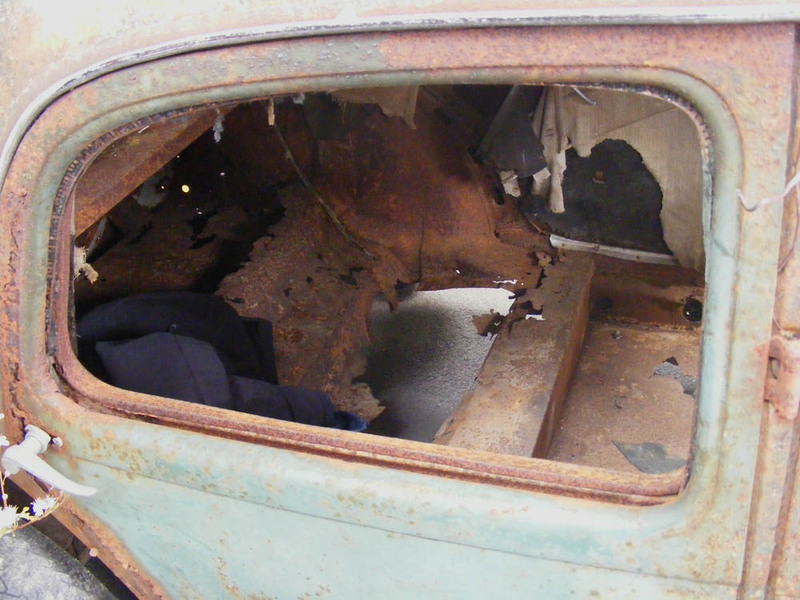 I don't think anyone has a serious intention of restoring it to working order. What's left of the interior. Two club members discuss the vehicle. Last Saturday we attended the Auto Bourse at Chatellerault. As usual we had lunch with La Traction Universelle. Everyone brings something to share (my hard boiled eggs topped with cream cheese and bacon went down a treat) and before the meal there is an aperitif, with a toast. Orchard News: I spent yesterday afternoon digging in the potager. It's hard going, with the soil only just workable. I spent quite a lot of time scraping accumulated wet clay off my gloves, and trying to convince weeds to go into the weed bucket and not just stick to my gloves was getting on my nerves. However, there was reassuring bee activity, with an Early Nesting Bumble Bee Bombus pratorum working in the almond and a queen White-tailed Bumble Bee B. lucorum checking out Field Cricket Gryllus campestris holes as she searched for the perfect site for her nest. She was either a bit fat for the cricket holes, or there was an outraged occupant just out of sight of the entrance, as she had several goes at entering the hole, but never entirely disappeared down one. Quite a few of the Field Crickets were sitting in the sun at the entrance to their burrows, but it's still too cold for them to be chirping. I saw my first bee fly of the season, the Dark Edged Bee Fly Bombylius major, always the first of its kind to appear. There were several solitary bee species present too -- male Mining Bees Andrena sp, the tiny Halictid bees, a male Hairy Footed Flower Bee Anthophora plumipes and a female European Orchard Bee Osmia cornuta. Not many butterflies -- just a couple of Brimstones Gonepteryx rhamni and a few Peacocks Inachis io -- and a new species for me, a Large Tortoiseshell Nymphalis polychloros! They really are quite large. At first I thought it was a Silver-washed Fritillary Argynnis paphia, but it is totally the wrong time of year. Unfortunately I didn't manage to get a photo of it. Just recently I was rummaging in the freezer and realised I had a pork tongue that was getting on a bit, and a pork belly with damaged packaging, so I decided to pickle them. As always when confronted with curing meat, I consulted that hefty tome, Meat, by Hugh Fearnley-Whittingstall. 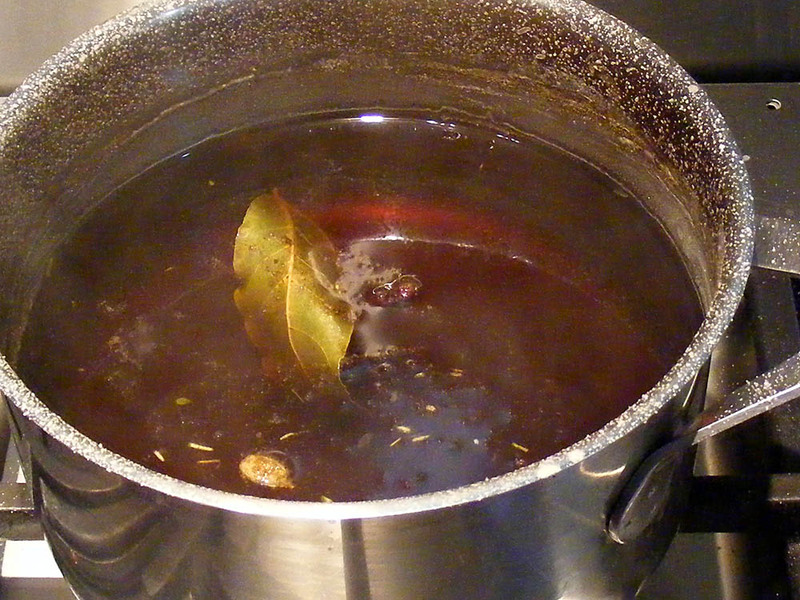 Just as I thought, he provided the ideal solution: mix together 2.5 l water, 250 g light brown sugar, 750 g coarse salt, ½ tsp black peppercorns, ½ tsp juniper berries, 2 cardamom pods, 2 bay leaves and a sprig of thyme, then bring to the boil for a couple of minutes. The pickled meat soaking in fresh water overnight. The meat is then placed in a plastic box and the cold pickling liquor poured over the top. This stays in the refrigerator for a week, being turned daily. After the week is up, the meat will be stiff because of all the liquid that the salt in the pickling liquor has drawn out. Drain the liquor off and discard. 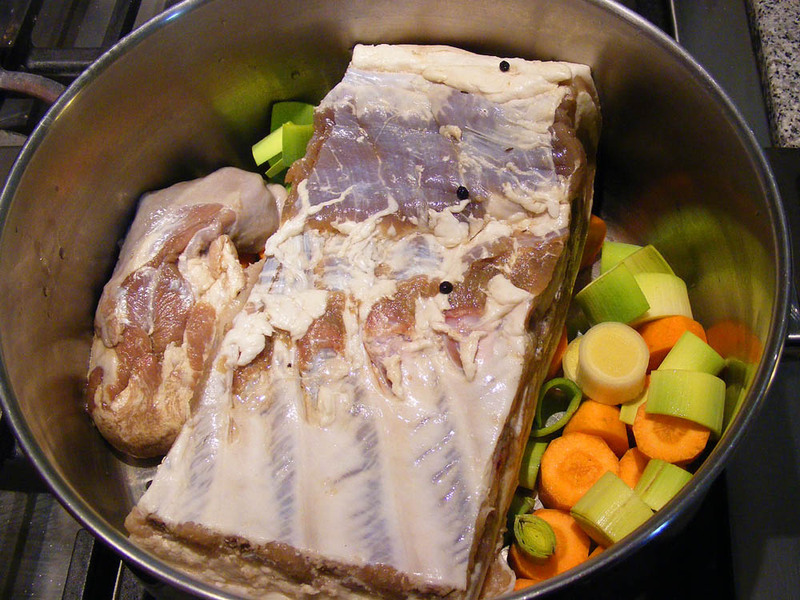 Flush the meat with fresh cold water and leave to soak overnight, otherwise it will be too salty to eat. Now it's ready to cook. Put it in a stockpot with chunks of vegetables such as carrots and leeks, a couple of bay leaves and some black peppercorns. Cover with fresh water and simmer for 2 - 3 hours. Once cooked the tongue should be peeled while still warm. It can be sliced and eaten warm with lentils or cold with salads or in sandwiches. The pork belly should be cut into thick slices and served as petit salé. Use the flavourful cooking liquor to also cook the lentils. Loire Valley Nature Updates: a new entry for Cyclamen Cyclamen hederifolium has been added. A new entry for Water Crowfoot Ranunculus (Batrachium) spp has been added. Other nature news: for those of you interested in the plight of our pollinators you might like to read Bees, Lies and Evidence-based Policy, an article in Nature by Lynn Dicks, from the Natural Environment Research Council in the UK. You may also like this TED talk on how flies fly. Orchard News: Peaches and nectarines just out. Parsley putting on leaves and bulking up, enough to harvest some. I was going to do some digging yesterday, but we had surprise visitors (more about that later). MAJOR ANNOYANCE: My key for the Renault has disappeared. I last definitely had it on Thursday when I went down to the orchard. All I can think is that it fell out of my bag in Tours or Chatellerault on Friday or Saturday, both days when only Simon drove and he used his key. 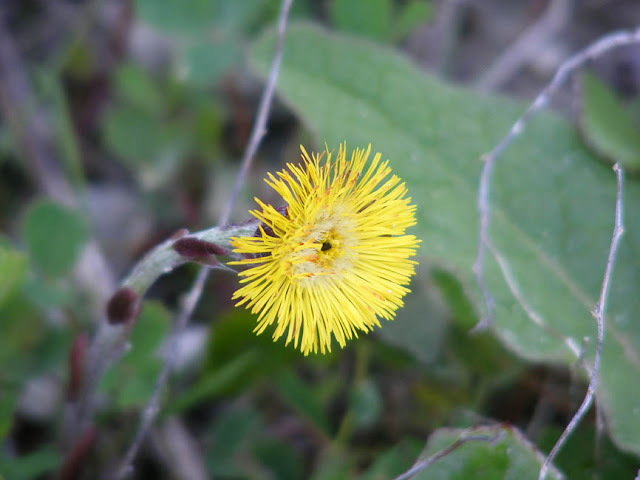 Coltsfoot Tussilago farfara is an odd plant, found in chalky waste ground. It flowers early in the year, before its lookalike cousin the dandelion. The leaves, which I assume were thought to resemble the shape of a colt's hoof print, don't appear until after the flowers. 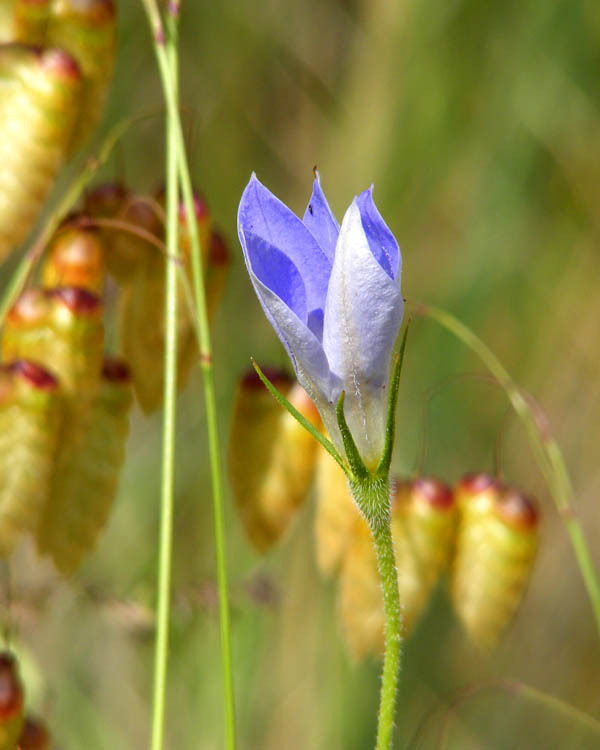 It is native to here and I encounter it every now and then around the Touraine in the spring but apparently it can be a real nuisance and very difficult to eradicate in countries where it has been introduced. The leaf is the rather angular heart-shaped one centre left. Its scientific name gives you a clue that it was once considered of medicinal use. Tussilago is from the Latin meaning 'acting on coughs'. 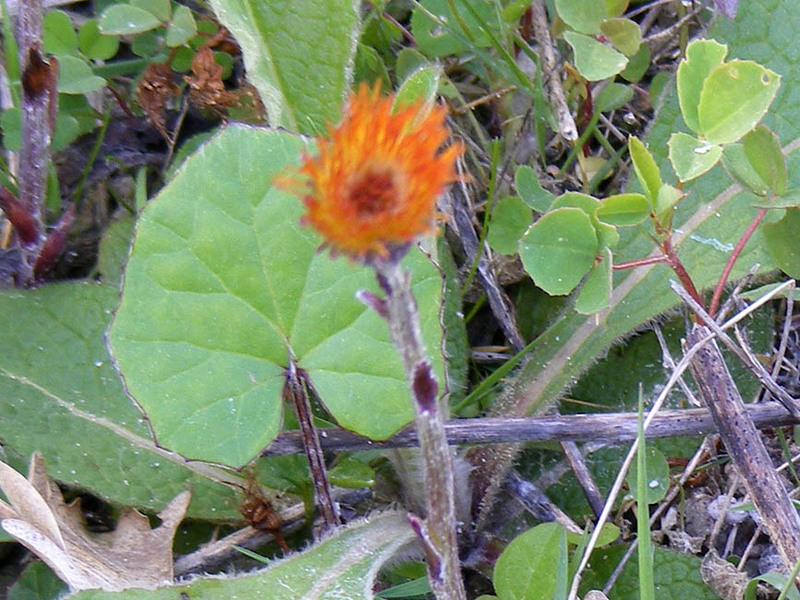 The dried leaves and flowers were smoked or taken infused in a syrup to relieve coughs, including asthma. Unfortunately, in modern times it was discovered to also contain a toxin which if taken in sufficient quantity can lead to liver damage, so it has been a bit discredited as a medicine, with at least one European country banning its sale as a herbal remedy unless from a specific cultivar known not to contain the toxic substance. 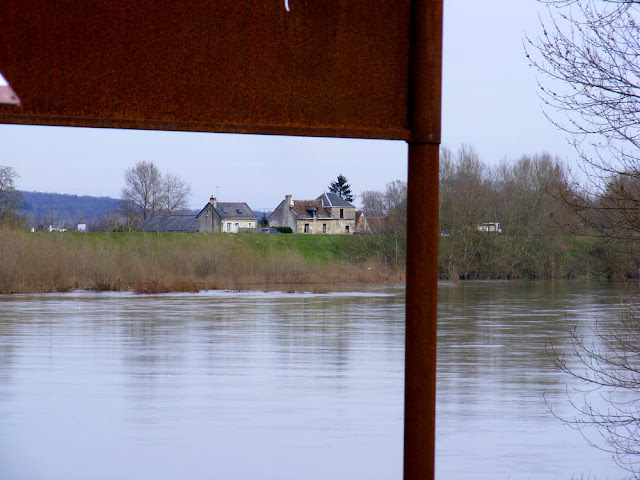 Loire Valley Nature Updates: A new Habitat entry for Small Man-made Lakes (Etangs) has been added. 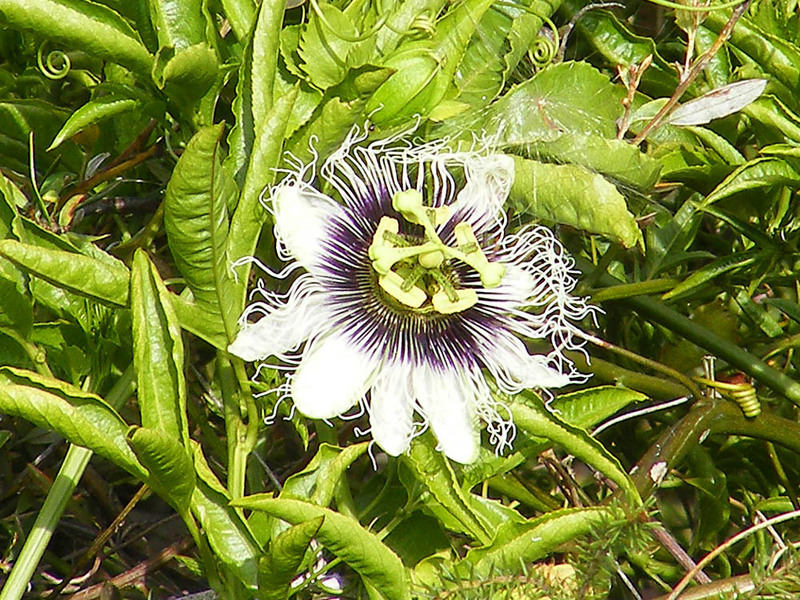 The passion flower Passiflora spp is associated with the Passion of Christ because of the shape of its flowers. Wikipedia explains the Christian symbolism in handy dot points. You often see passion flowers used as a motif in churches in Holy Week, particularly in embroidered altar cloths and priestly regalia. Sadly this one, which is the common commercial fruit producing species P. edulis, is an escapee, growing in the bush on Brown Mountain in New South Wales. It is native to South America. 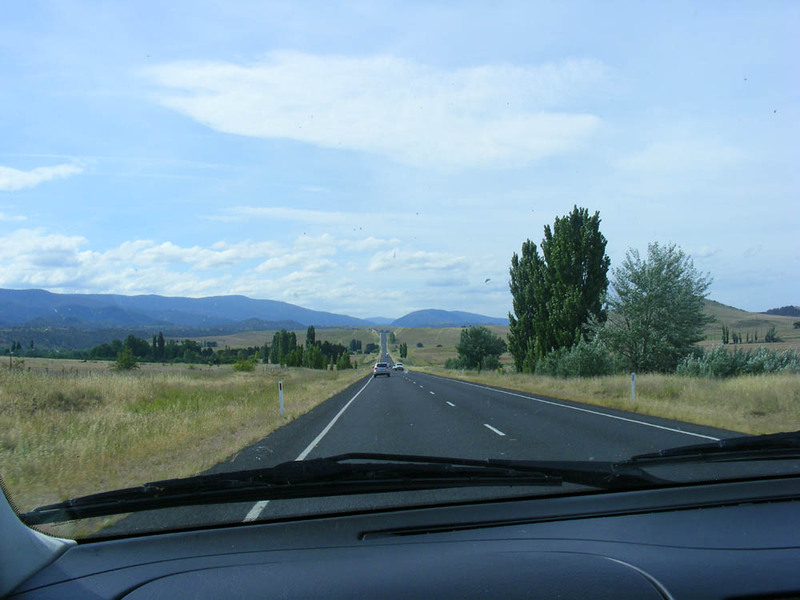 Typical traffic levels on the Monaro Highway. 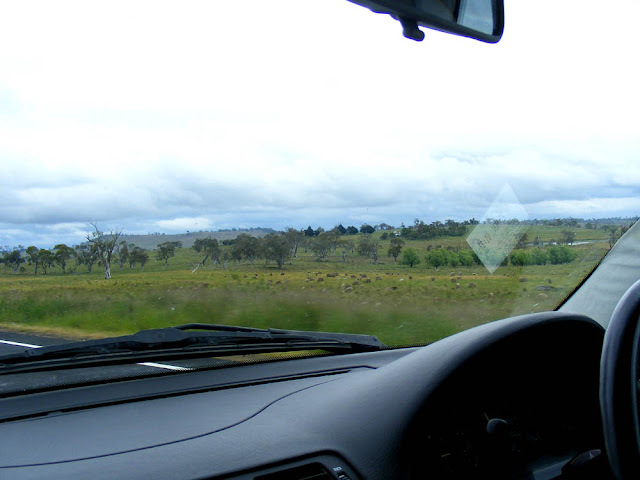 The romantic sounding Monaro High Plain is a tableland, 900 metres above sea level, lying between the Great Dividing Range to the east, and the Snowy Mountains to the west. It is a naturally treeless plain covered in native speargrasses Stipa spp that since its discovery by white explorers in the 1820s has been used for extensive grazing of sheep and cattle. Long established Lombardy Poplars are everywhere on the Monaro, presumably planted by early settlers as windbreaks. 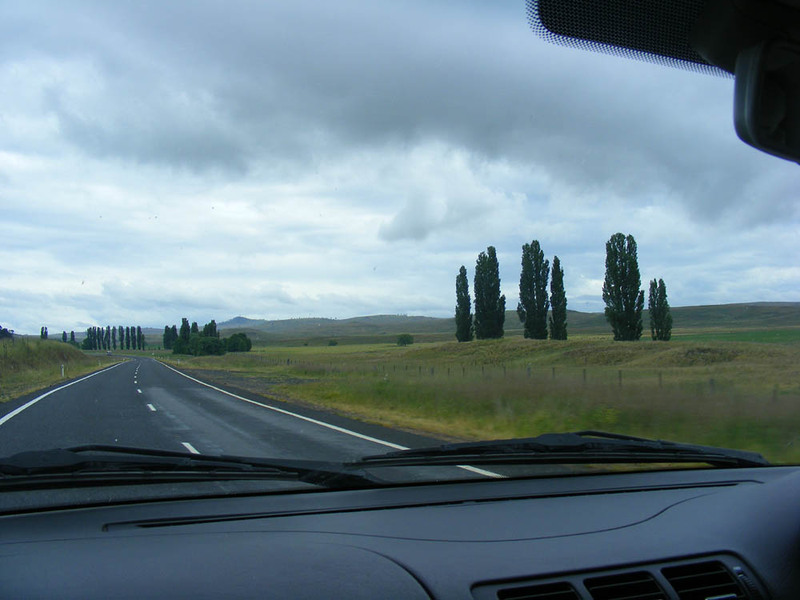 We drove through it several times when we were in Australia late last year. The grass was so high fences and the smaller stock were almost obscured. We cannot remember the last time we saw this area looking so good. Effectively, this area has been in the grip of a severe drought for the whole time we have lived in Europe (15+ years) and before. There may have been brief periods of respite, but they certainly didn't coincide with any of our visits. We remember a countryside almost devoid of stock by the end of the 1990s, dusty and exposed, and it continued that way throughout the first two decades of the 21st century. The fence is visible through a screen of grass plumes. In late November 2012 it was a sea of waving grass, punctuated by contentedly munching Aberdeen Angus and Hereford cattle (or their bald faced hybrid progeny) and Merino sheep. Stock numbers are only just getting back to pre-drought levels, as many farmers had long ago sold or agisted their herds because of lack of feed, keeping only a core minimum of breeding animals. Only time will tell if the rains will come reliably and a few good years can be enjoyed once again. Because of its position between two mountain ranges it lies in a rain shadow, so boom years like it is clearly experiencing now are all too infrequent. 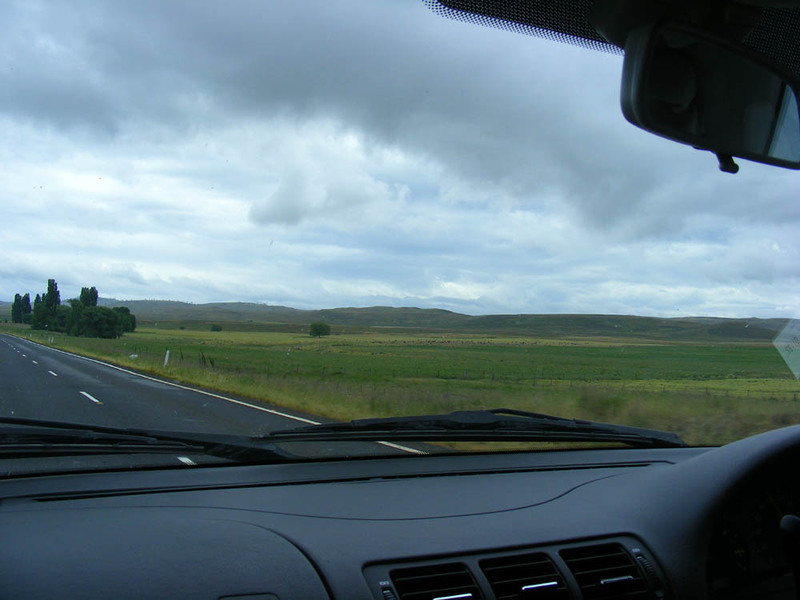 The Monaro Plain is encircled by mountains. 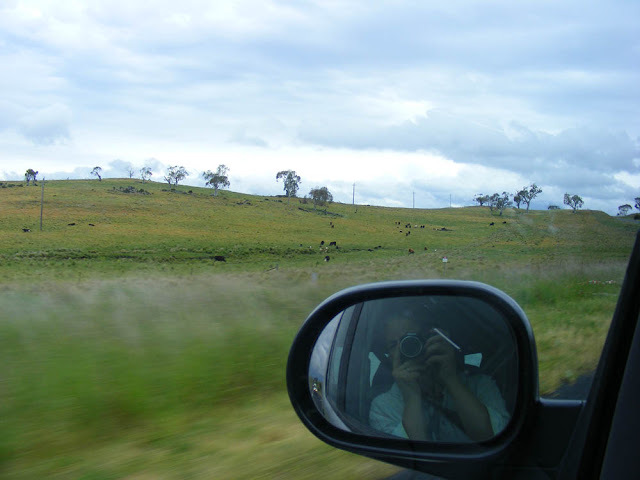 Me photographing grazing cattle from a moving vehicle. Earth Hour: the annual World Wildlife Fund initiative Earth Hour is tonight. If you are unfamiliar with this event, the idea is to symbolically register your support for the environment by switching off all lights between 8.30 and 9.30, local time wherever you are. My advice is to find a friend with a telescope and spend an hour outside in the dark watching the sky. 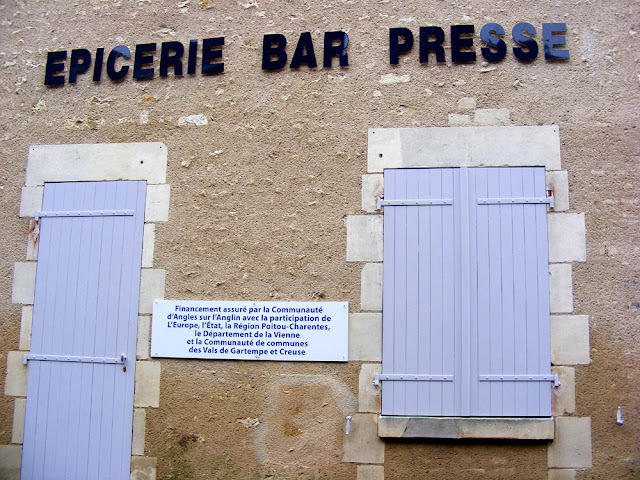 Nature News: We saw our first swallow of the season yesterday, in La Celle Guenand. Hurrah! Habitat Matters: Alex Wild had a short and to the point rant over on Myrmecos the other day. He is absolutely right -- if you are a nature conservationist or an ecologist or even just a concerned citizen worried about the loss of bees and butterflies, if you are not concentrating on loss of habitat issues you are just fiddling at the edges of the real problem. The front entrance to the new store. 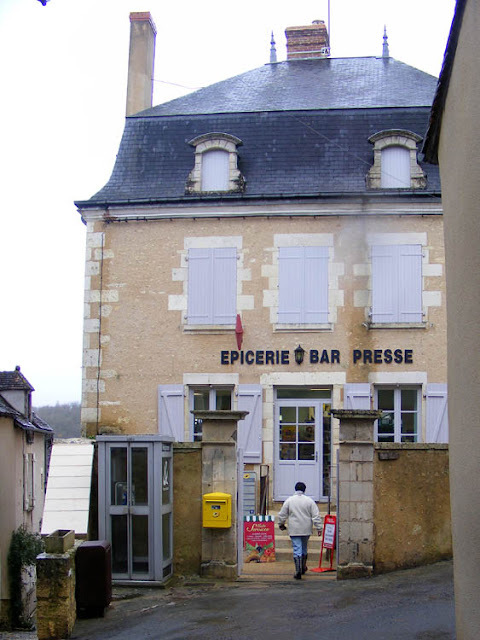 The old épicerie bar presse (grocery store/bar/newsagent) in the picturesque little town of Angles-sur-l'Anglin was in a quaint old building with visible beams and an open fireplace, facing the market place. The new improved épicerie is in a restored building down an alley just off the market place. Outside it is all lovingly restored stone and render, inside the space is white and modern -- easy to keep clean, well lit, a constant temperature. 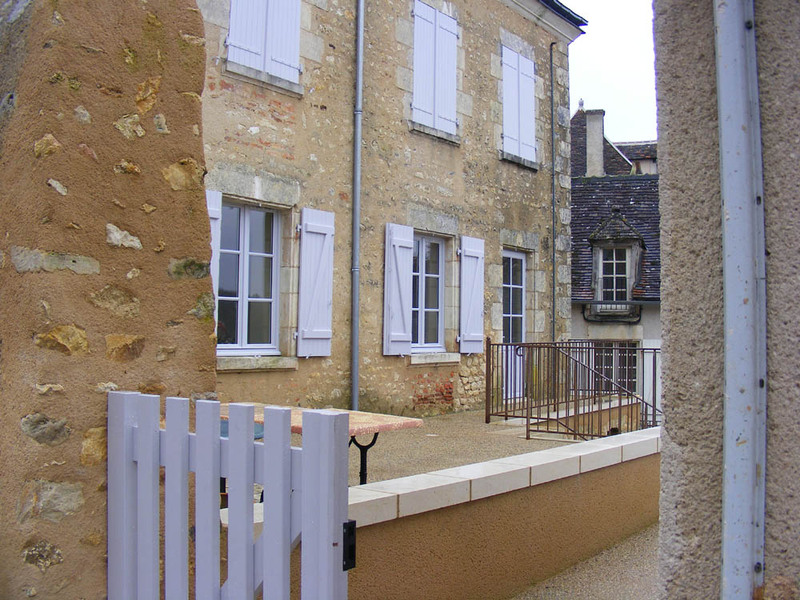 Out the back is a terrace on several levels. The improvements have been funded by various levels of government, as it is seen as important that little places like this don't just wither away through competition from the big supermarket chains. The terrace out the back, taken from the back entrance. Nevertheless, my friend Sweetpea, who lives in the town, has a sneaking nostalgia for the old-fashioned shop that has been lost, and thinks it's a shame the location of the new one is not so good as the old. She tells me that the owners of the houses that the new terrace overlooks are also a bit concerned about having their privacy invaded. Sponsored by...every level of government put some money in the pot. Personally, I think the new place is rather nice, all spick and span. The service is just as friendly, and the products are better displayed. When she and I called in there in late January on a Sunday, a couple of people were eating oysters they'd bought at the market less than 50 m away and drinking eau de vie (or lemonade and white wine) at one of the tables in the bar. It looked thoroughly convivial. Orchard Update: The almond is flowering and the peaches and nectarines are just about to burst open. Nothing else is even close, and probably just as well. It's still to wet to dig in the potager. There are hundreds of orchid leaf rosettes now, and in several places it is clear new plants are establishing themselves in little groups. Just now there are lots of deep purply blue Sweet Violet Viola odorata flowering in the grass, as well as a few white ones. It wasn't very cold yesterday, although it was drearily overcast. A single female European Orchard Bee Osmia cornuta was inspecting the western wall of the house for possible nesting sites, and an Early Nesting Bumble Bee Bombus pratorum queen was buzzing in and out of small mammal holes in the potager. The bumble bees find the potential nests by smell. They like to reuse abandoned vole holes, and it is possible that a hole is used in turn by bees and voles alternating year after year, each attracted to the scent of the previous year's occupant. 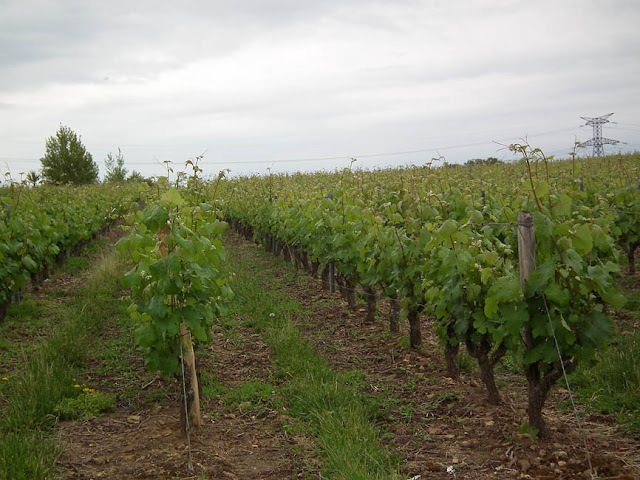 A few weeks ago there was a report on the radio about a study of pesticide residuals in and around a village in Gironde, part of the Bordeaux region to the south-west of us, where winegrowing is very intensive. 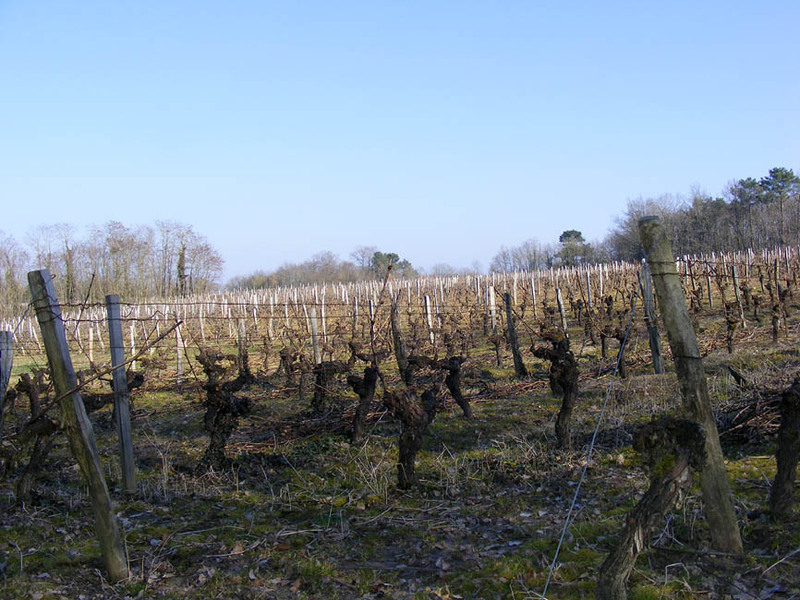 The study revealed that vine workers retained traces of pesticides at rather alarmingly high levels, including one in particular which was banned 10 years ago and has not been widely used for 20. Viticulture is responsible for 20% of pesticide usage in France, and this surfaces as an issue regularly in the media, especially as in some areas, pesticide usage is increasing. The sample group of 15 vine workers had 11 times higher levels of pesticide present in their hair than the average person. A group of 5 village residents had 5 times the average level. What the media has really picked up on though is that around half of the chemicals found are known carcinogens. 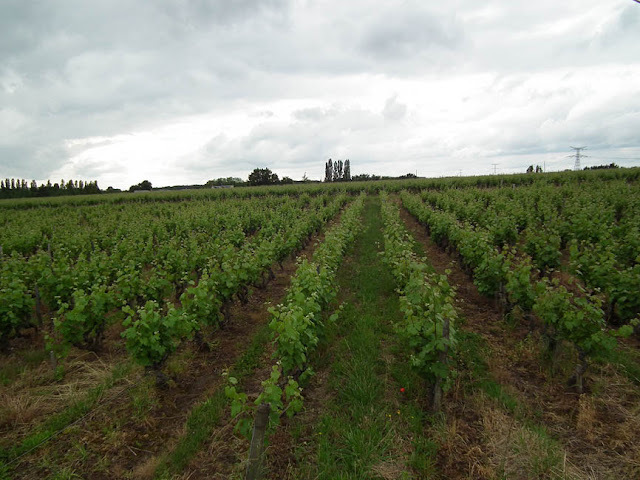 My impression is that pesticide usage is significantly lower in the Touraine, partly because almost all the wineries are run by small family businesses who are passionate about what they do, and partly because vines aren't nearly so much of a monoculture in this area. However, I wanted to know if my impression was backed up by actual practice, so I contacted a few of the winegrowers we know to see what they said. Although none of them are certified organic, they range in practice from organic principles to a more pragmatic approach to using pesticides if they judge the health of the vines and the grapes require it. What they all have in common is a close personal involvement with the management of the vines and a strong commitment to making the best wine they can. They say you can't make good wine if your vines aren't healthy and the grapes aren't in good condition. One of 'our' winegrowers said that he treated his vines 9 times during 2012, due to the poor conditions during the spring and summer. He was quick to point out though, that many organic producers had to treat their vines twice as often. For both regimes the cost was considerable. 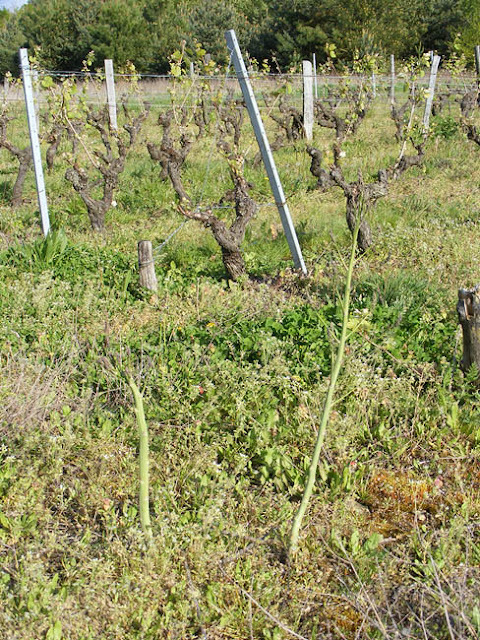 The equipment used to spray vines has developed alongside the pesticides. Nowadays, the application is much more precise, and there is far less drift with modern sprayers. 'Our' winegrowers take issue with the report's claim that pesticide usage is increasing year on year. Their experience and practice is that it is decreasing. Vine management techniques improve every year, and they make sure they stay up to date. They are not stuck in the old ways if the old ways are detrimental to the sustainability of their industry and the quality of their product. They embrace new methods and new research when they are convinced it makes sense. Those who use modern pesticides also say that they believe there is a good deal of progress being made in researching new products that are much less blunt instruments than some of the old products. They are all very uncomfortable with the idea of GMOs however, and don't see vines genetically modified to resist disease as the way forward. Yesterday I went to the dentist for the first time since I've lived in France. Yeah, yeah, I know your dentist tells you to visit every 6 months for a check up but since the dentist in Preuilly very quickly ascertained there is nothing at all wrong with my teeth, you can perhaps appreciate why I only go every few years. Luckily I have teeth that rarely give me trouble, and the dentist had so little to do for me that he didn't even charge me! Just recently I found myself with a surfeit of walnut oil and some aging buckwheat flour, neither of which have a particularly long shelf life. Around the same time Simon pointed out a recipe by Dan Lepard that he thought looked rather interesting. 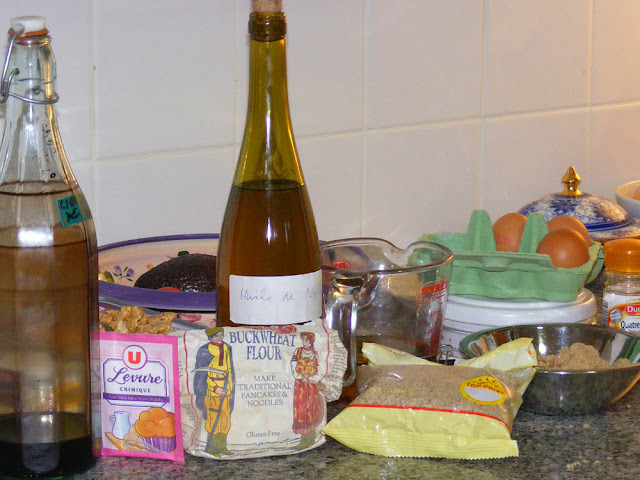 Ingredients for Walnut Oil Cake. 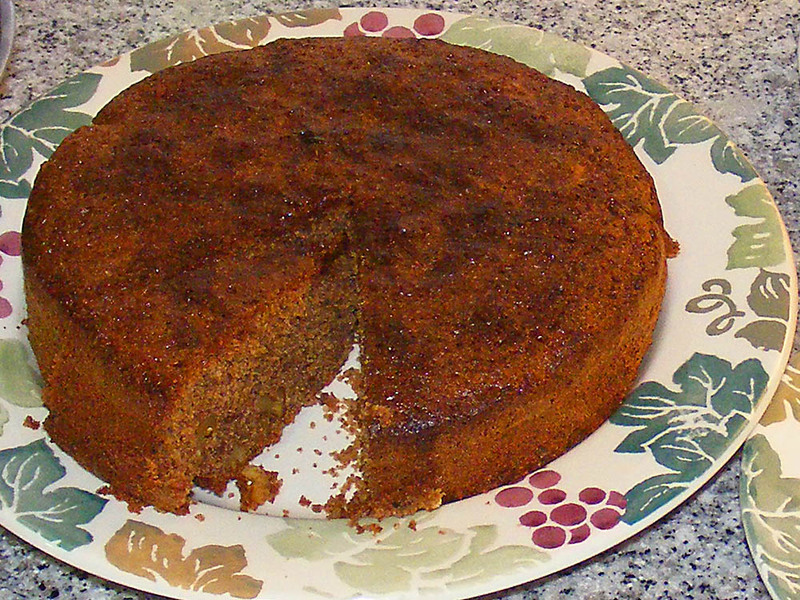 Dan indicated that the ingredients for what he called Spiced Olive Oil Cake were fairly flexible, so I merrily substituted my way through the recipe. My list of ingredients was as follows: 3 eggs, 150 g dark brown sugar, 150 ml walnut oil, 30 ml cold water, 2 handfuls chopped walnuts, 100 g almond meal, 100 g buckwheat flour, 1 tsp baking powder, 2 tsp quatre épices. To make the cake I followed Dan's method. To serve the cake I first dribbled a tablespoon of liqueur de noix over the top. Then I mixed 1.5 tbsp liqueur de noix into 50 g icing sugar. Once smooth I added a box of cream cheese (fromage à tartiner) and beat it in. Rather than use it as frosting, I simply cut the cake into wedges and served a dollop of the cream cheese mixture on the side. This meant I didn't have to refrigerate the leftover cake, just the cream cheese, and the cake stayed fresher for longer (refrigeration doesn't do baked goods any favours). Like all oil based cakes, this one improves with keeping a day, and keeps very well for several days. Coeliacs will notice that my version is friendly. We have two 300 litre cuves (tanks) for rainwater collection at the orchard. They have lids on, but every now and then one of the resident Common Wall Lizards Podarcis muralis will find a way in. If I don't make sure there is a stick to provide an escape route they can drown. I think what must happen is that they get too cold to manage the climb out, and if the water level is low, it's probably too smooth and vertical. Unfortunately, about once a year, I find a sad little floating body. It's always the juveniles, who I guess have less reserves of energy than the adults. 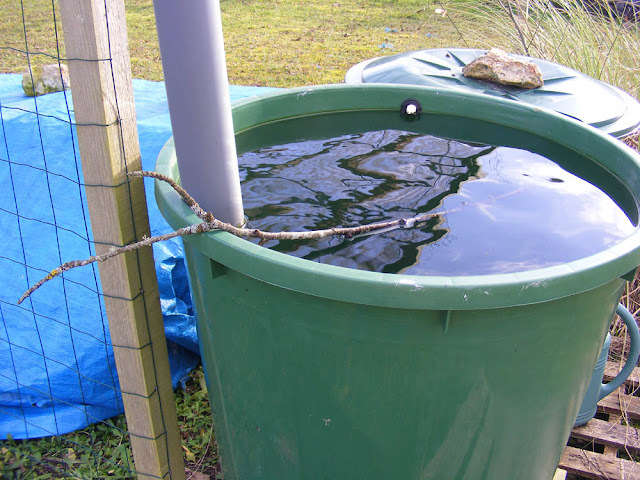 Sometimes they are unlucky, and the wind will have blown the lid off and the safety escape stick out onto the ground. The day we went to see the wall paintings in the Chapelle de Tous les saints with Niall and Antoinette we had also arranged to lunch together, along with Tim and Pauline. 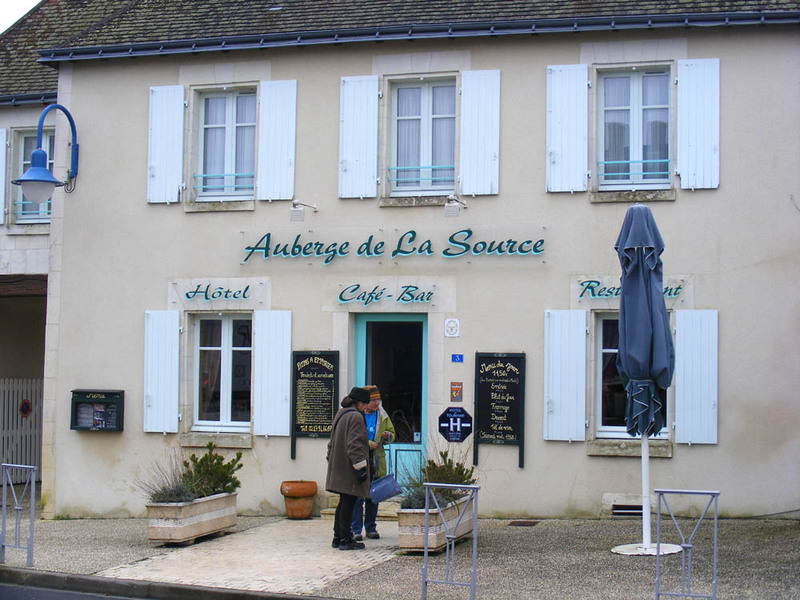 Antoinette recommended the Auberge de la Source in the nearby village of Saint Flovier. She and Niall had dined there a couple of times in the past, but neither Simon and I nor Tim and Pauline had eaten there before. In the event, Antoinette and Niall didn't join us, as they had some last minute work come in, but we went off to Saint Flovier to meet Tim and Pauline as arranged. Pauline and I discuss the pot plants out the front. We were very favourably impressed. The day we were there the menu was tuna in brick (a North African crispy pastry) served on a salad, a generous serve of rich and hearty beef casserole with mashed potato (I suspect the mash came out of a packet) and a very simple, but very delicious apple tart. Cheese and wine is included, but coffee is extra. Like most village restaurants, this is a husband and wife operation, with him in the kitchen and her doing front of house. The service is friendly and the restaurant and bar attractive. We enjoyed it very much, as it is one of those places that charges a standard price (€11.50), but provides a meal that is a cut above average -- good quality, simply but well presented, and dishes that are a bit more creative than the usual run of the mill offerings. 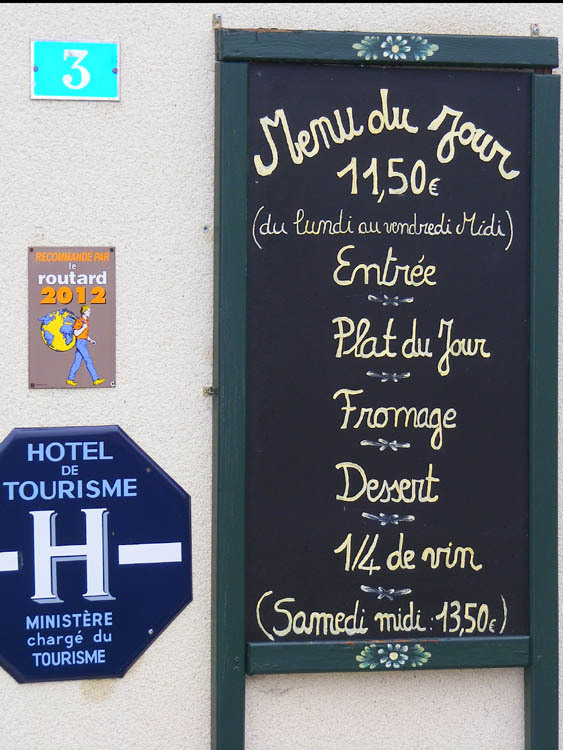 It is deservedly in Routard, the ever reliable French restaurant guide that lists restaurants of all sorts so long as they offer good quality at a reasonable price. It's not on the main road though, so you have to know that it is there. St Flovier is one of those places where the centre of town ie the market place, is one street back from the main thoroughfare. The auberge faces on to the market place, opposite the church and the town hall on the other sides. Loire Valley Nature Updates: a new entry for Saddle-backed Bushcricket Ephippiger ephippiger has been added. A habitat photo has been added to the Violet Helleborine Epipactis purpurata entry. A new entry has been added for Drone Flies Eristalis spp. 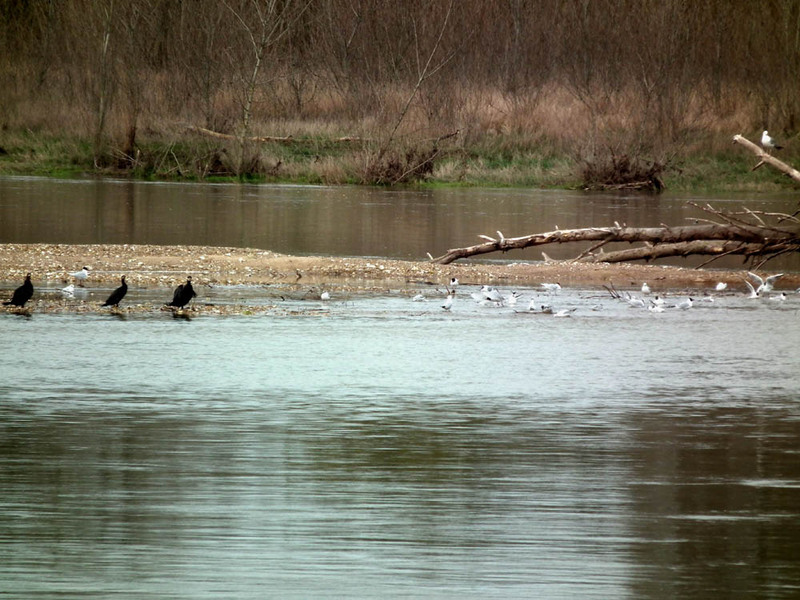 Yesterday we trekked across the Brenne and the Sologne to pick up a sister for Célestine. 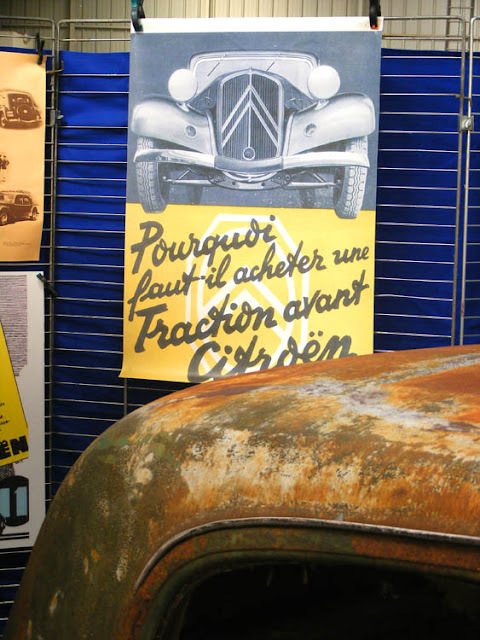 After months of scouring LeBonCoin we have finally found another Traction Avant in the right condition for the right price. Her name is Claudette, and she is 3 years younger than Célestine. Her motor and gearbox are in superb condition but she's not ready to take out with clients just yet. We've left her in the capable care of Doctor Traction over in Chateauroux. 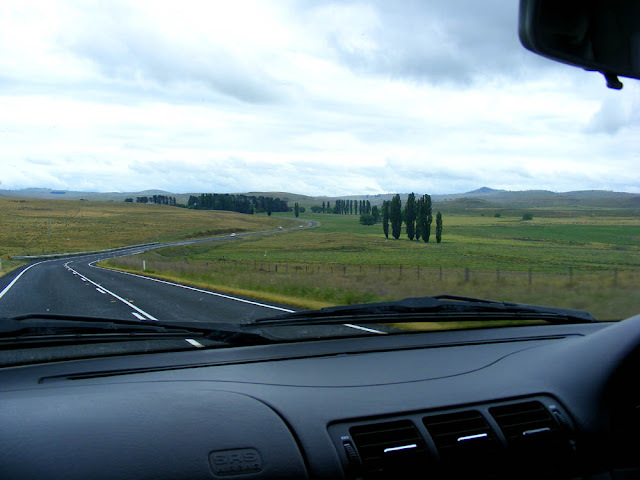 His first task is to sort out the brakes, which we have to admit do stop you amazingly well: they aim you into the ditch at the right hand side of the road. Next, the gear linkages need tweaking to allow a change from first gear to any other gear but reverse, and to stop her jumping out of second and third. Finally, there is some tinworm and problems with the doors, but we will send her to another specialist for that. Hopefully she'll be home and ready to start work in a couple of weeks time. In the meantime, we need to buy new carpets for her, and find a garage somewhere near Tours so she and Célestine don't have to do so many kilometres. 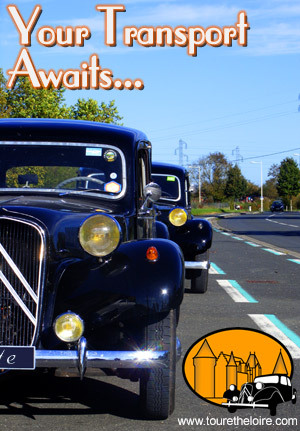 If anyone knows of a garage for rent in Veigné, Saint Avertin or Chambray lès Tours, please let us know. 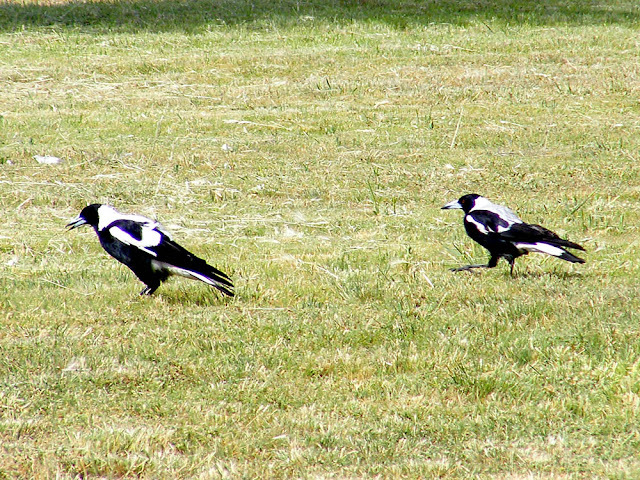 Maggies walking across a lawn, listening for grubs to pounce on. 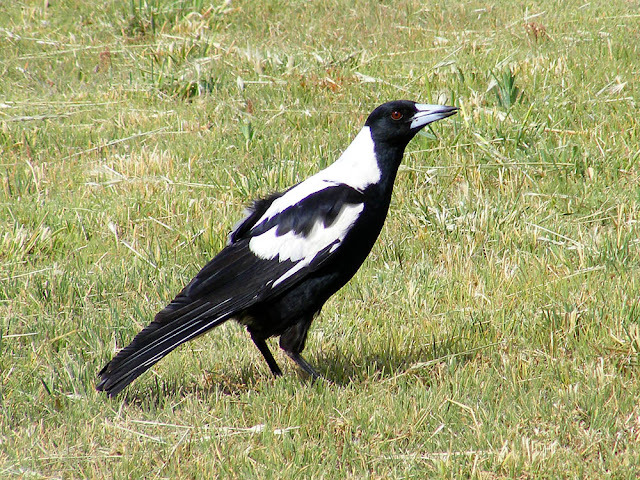 The Australian Magpie Gymnorhina tibicen is an instantly recognisable feature of the landscape just about wherever you are in the country. Unlike the Eurasian Magpie Pica pica, which is a member of the crow family Corvidae, Australian Magpies belong to a family of large shrike or crow like birds called the Cracticidae, which are restricted to Australasia. They are highly intelligent birds, perhaps as clever as dogs, and are just as happy to live in proximity to man as in the outback or the bush. Their warbling and carolling (and the persistent nagging call of young begging for food) is unmistakeable. I've no doubt it is a sound unique to Australia that is much missed by many expats. 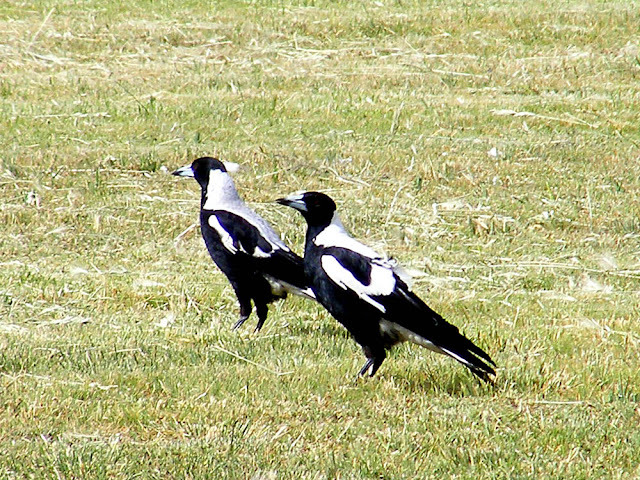 What they won't miss is the occasional male Magpie whose testosterone rages out of control, causing him to attack pedestrians and cyclists within 100 m of the nest. Whenever one of these rogues moves in to the neighbourhood, walkers are well advised to wear hats with fake eyes painted on them and cyclists need to attach cable tie spikes to their helmets like this if they are to avoid being violently dive bombed and pecked. It's enough to make a kid take the extra long way round to and from school, I can tell you. Ian Fraser, over on Talking Naturally, points out that this strong black and white coloration often indicates a creature is agressive. PS: When I was searching for recordings of magpies calling I came across some birdsong ringtones for mobile phones -- I am so tempted to get the maggie one! Back row, left to right: chicken legs and breasts, rabbit legs, chicken gizzards and necks (in plastic box). Front row: whole chickens (with giblets and heads), a guinea fowl just visible on the right. 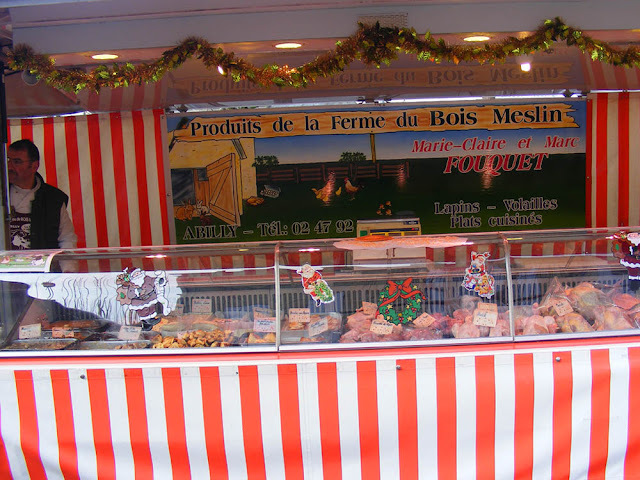 This is the market stall where I regularly buy whole chickens (requesting that the head is removed), chicken necks (very cheap, make great stock and have a surprising amount of meat that can be picked off) and the occasional slice of rabbit terrine. I see them at the Preuilly market, and at Loches. 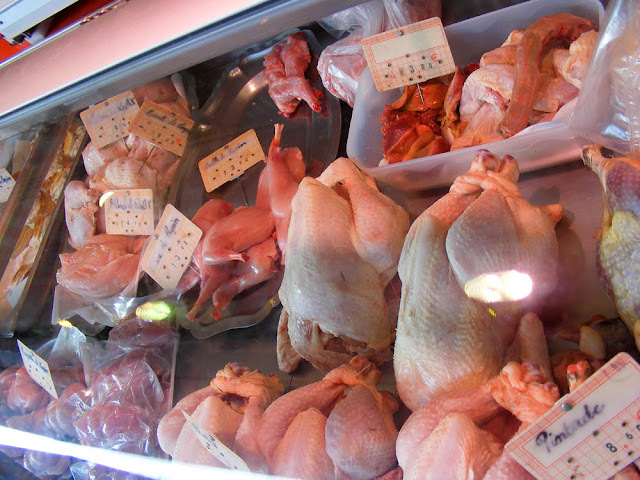 The Fouquet's, from nearby Abilly, raise poultry and rabbits for the market. They do a lot of value adding by making terrines and sausages. 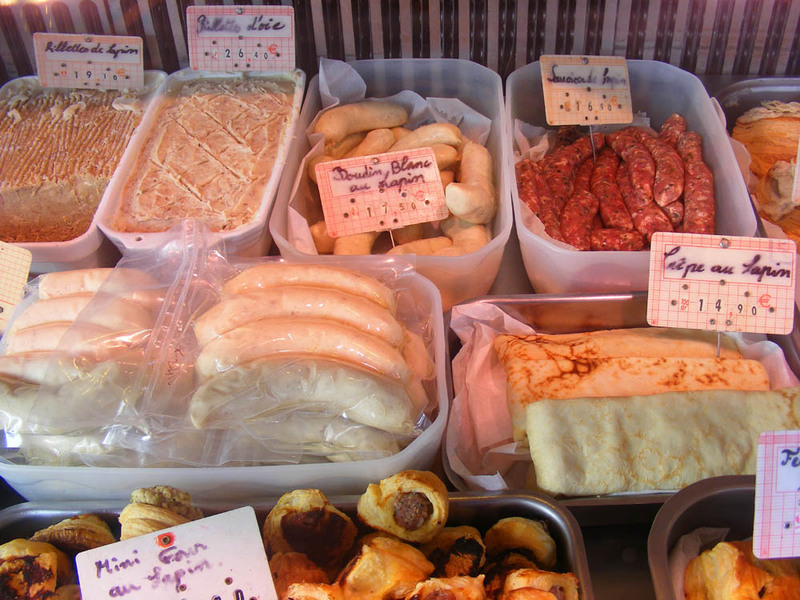 Back row, left to right: shredded rabbit paste (rillettes de lapin), shredded goose paste (rillettes d'oie), rabbit white sausages (boudin blanc au lapin) and rabbit sausages (saucisse de lapin). In front, rabbit cocktail sausage rolls (mini four au lapin) and rabbit pancakes (crêpe au lapin). 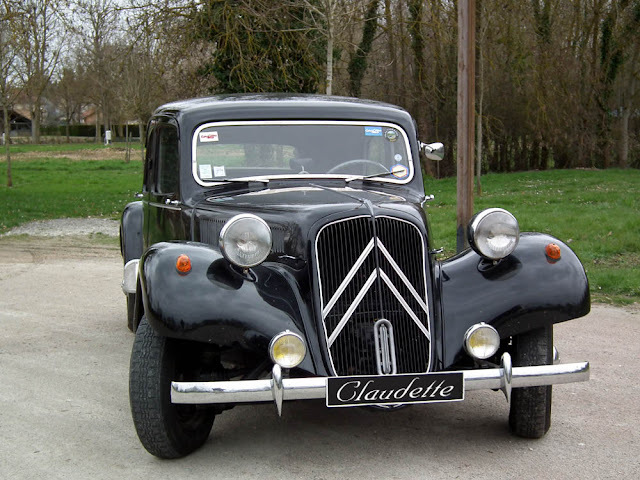 Weather Update: yesterday I drove through a classic giboulée de mars on my way to the dermatologist in La Roche Posay (routine check for signs of skin cancer, nothing of significance to report). I had squally rain, a bit of snow and some hail, and it's jolly cold after our few warm sunny days not that long ago. Loire Valley Nature Update: a new entry for London Plane Platanus x hispanica has been added. A photo has been added to the Early Spider Orchid Ophrys aranifera entry. A photo has been added to the Emperor Moths Saturniidae entry. 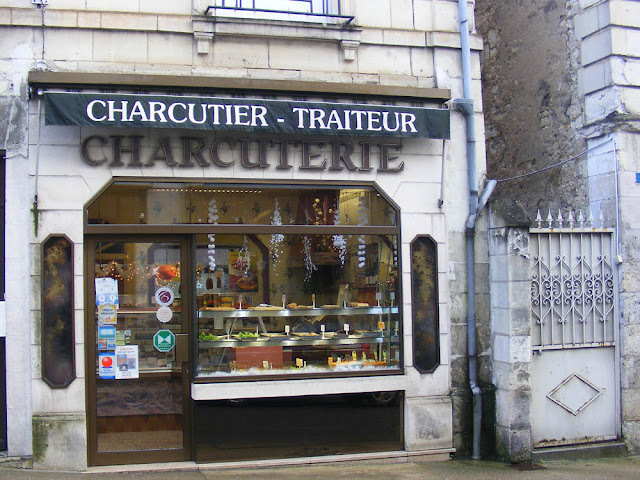 The Charcuterie in Preuilly-sur-Claise, in the main street. The charcuterie in Preuilly is well patronised and they have a good range of products. Most are made in house, some bought in. 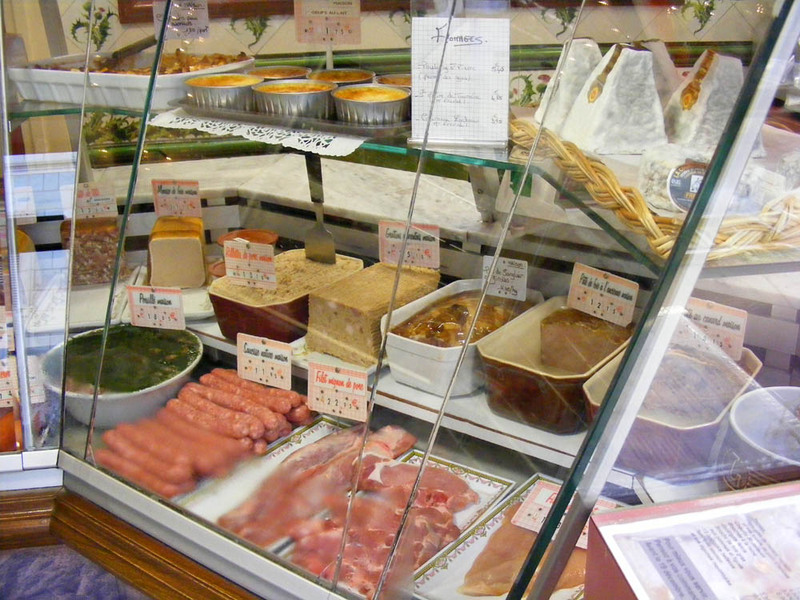 French charcuteries focus mainly on value added pork products -- often cured, but sometimes simply cooked and ready to eat. They also do salads and prepared dishes. This is because many of them, like the one in Preuilly, are also traiteurs (caterers). 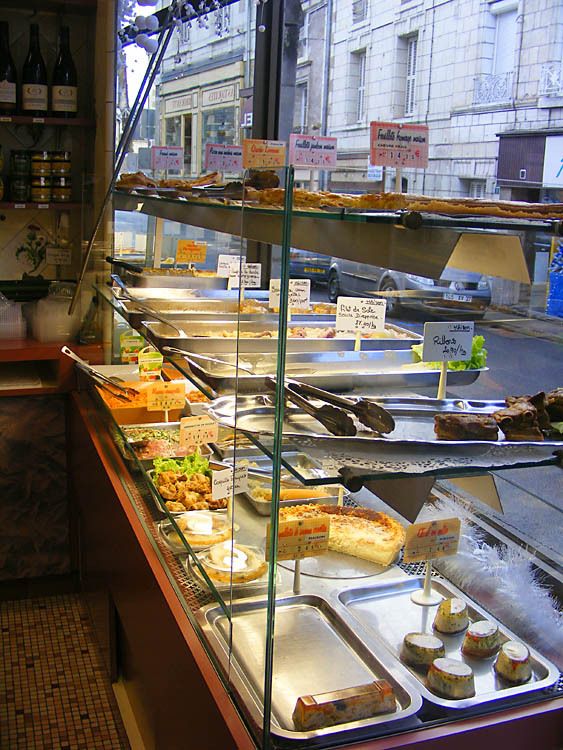 In the window there is always an array of tempting prepared dishes. On this day there was anchovy pizza, quiche Lorraine, feuilleté jambon (ham in flaky pastry), feuilleté fromage chèvre frais (fresh goats cheese in flaky pastry), rillons (slow cooked cubes of pork), fillet of sole with Dieppe style sauce, paupiette de dinde aux champignons (turkey parcels with mushrooms), tongue in some sort of sauce, coquilles st jacques (a classic scallop dish), hachis parmentier (cottage pie), hard boiled eggs in aspic, salmon and prawns in aspic and sausages and beans, all made in house. I shop here about once a fortnight, buying all sorts of cured meat, terrines and patés, salads and occasionally something like a savoury pastry or soused herrings. And in this cabinet we have baked custard, local goats cheeses (Pouligny St Pierre, Ste Maure de Touraine and Couronne Lochoise), wild boar paté with wild girolle mushrooms, grattons charentais (like rillettes, a type of pulled pork paste), persillé (parsley brawn -- the name means 'parsleyed', and also 'marbled'), rillettes de porc, plain sausages, brawn, two sorts of liver paté and pork fillet. The place is owned and run by Régis Mas and his wife. In the usual way of these things, he works out the back in the kitchen and she runs the front of house. They live over the shop. Bayonne ham is the most prestigious of French dry cured hams, and Vendéen comes a good second. 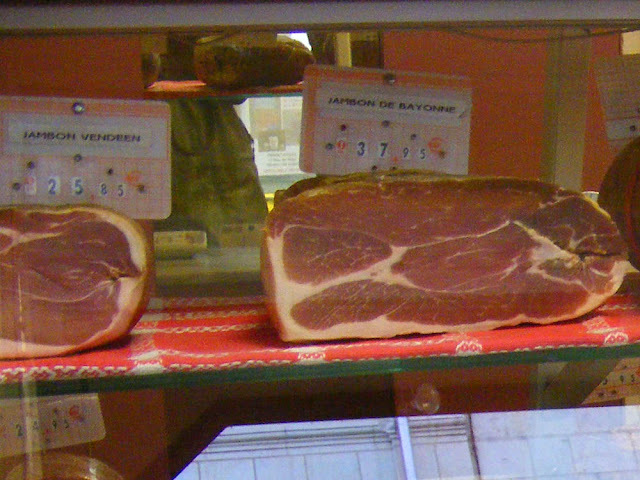 Four wafer thin slices of ham to go with lunch will cost less than €2. 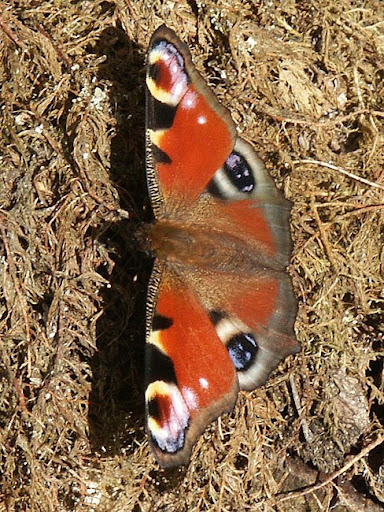 This time of year traditionally presents a problem for those of us who grow their own food. Anything that is capable of overwintering is either getting a bit unappetising or has been eaten already. The new season's crops are only just being sown. In the old days, when people had to depend on their own resources and couldn't supplement with vegetables brought in from gentler climes, it got a bit lean in February, March and April. So what did people do? 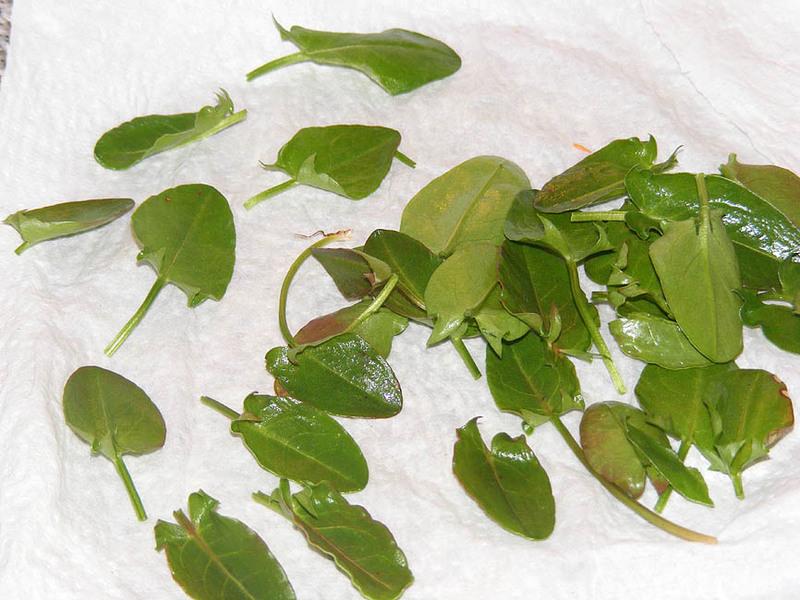 Baby sorrel leaves, washed and ready to be added to a salad. Well, one of the things they did was forage in the wild. This time of year is especially good for new season baby wild greens. Sorrel Rumex acetosa is a particularly tasty wild green in my opinion, and easy to identify. I happen to know that there is a little patch on the riverbank right in the middle of Preuilly, and in mid-March the leaves will be about 3 cm long. When they are this young they are ideal for adding to salads. The zingy acidity of the leaves combines very well with the sweetness of grated carrot and the earthiness of raw beetroot in a refreshing and colourful starter, or in place of lemon on fish. Wild sorrel growing on the banks of the Claise River. 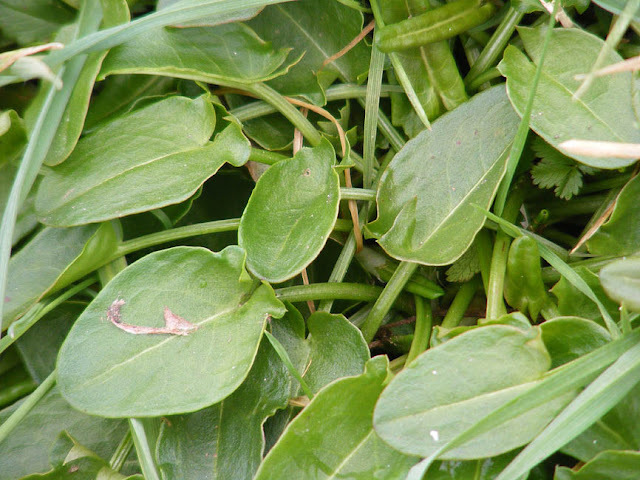 The flavour of Sorrel is due to its oxalic acid content - the same sharpness as in rhubarb. The older the leaves the stronger the flavour, which is why I like the baby leaves, with their pleasant tang rather than the mouth puckering, teeth jangling sourness of the mature leaves. The more intense flavour of the older leaves is usually dealt with by cooking. 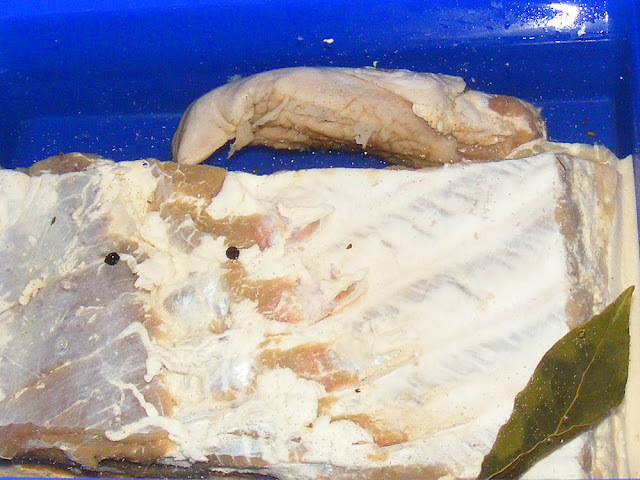 For example, in France it is traditional to stuff trout with sorrel and bake or poach the fish whole. Unfortunately, whilst cooking it undoubtedly mellows the flavour, the sorrel reduces to a sort of khaki smear, which is why I prefer to serve it fresh. 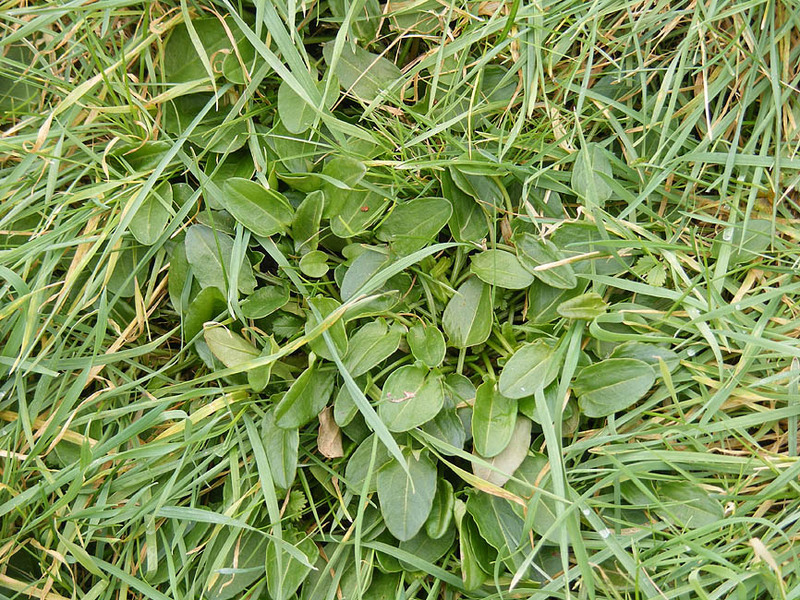 The young arrowheaded leaves are such a pretty shape too and can be arranged most decoratively. Sorrel, or oseille as it is known in French is a type of dock and is available in several cultivated forms as well as wild. Traditionally it has been added to other greens such as spinach, made into soup or pesto, added to omelettes and salads. Because of its oxalic acid content people with kidney or bladder stones shouldn't eat it, but rumours of its general toxicity are highly exaggerated. You would have to eat some outrageously impossibly large quantity of it to actually poison yourself. 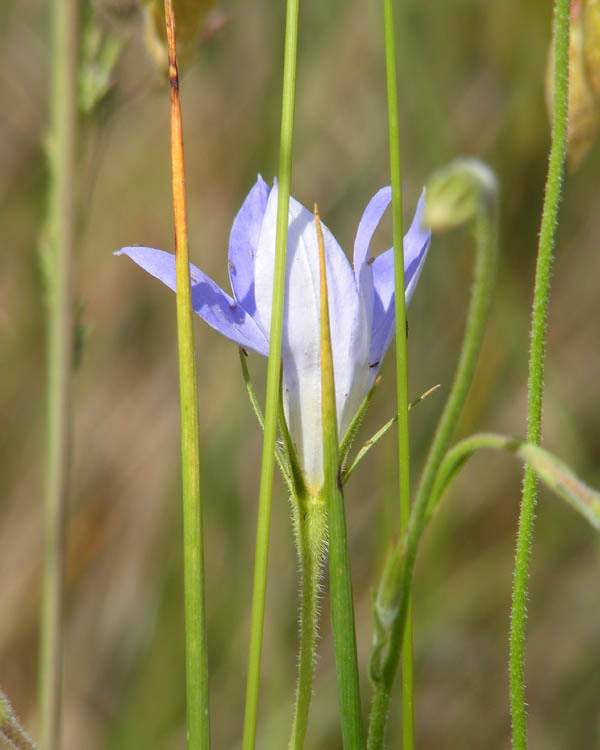 Loire Valley Nature Updates: a new habitat entry on Calcareous Grasslands has been added.